Talk about early holiday fireworks! Jennifer Lopez was on fire Friday night as she filmed her portion of the upcoming Macy’s Fourth of July Spectacular in New York City. 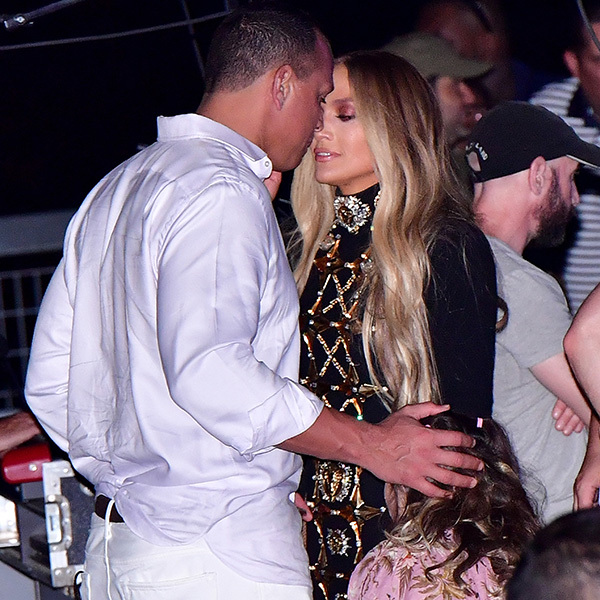 While the crowd loved her energetic performance, there was clearly no bigger fan present than her boyfriend Alex Rodriguez. The pair heated things up as they held hands and kissed each other backstage at the Hunters Point Park taping. The 41-year-old athlete first watched in awe as his talented girlfriend wowed the audience with some of her biggest hits and even debuted a brand new song. Jennifer paid a clear tribute to her boyfriend as she wore a bedazzled New York Yankees cap, along with a sparkling leotard and jacket. Showing off knee-high two-tone crystal boots by designer Kerin Rose Gold, the star strutted around the stage in front of a subway car set. At one point, the 47-year-old had the crowd roaring when she turned around and twerked toward them. Jennifer was proud of her twerking skills, sharing a snippet of her performance that included the move to her Instagram. The Shades of Blue actress wrote: “Watch the full performance where I debut a new song on July 4th on NBC at 8 pm #nituniyo #imstillimstilljennyfromtheblock.” The “Ni tu Ni yo” hashtag is the name of Jennifer’s new song, which she debuted at the televised event. Alex also gave fans a sneak peek by sharing a clip of the New York skyline with his girl singing out her new song in the background. The Shades of Blue actress was also seen in another form-fitting performance outfit: a long-sleeved black dress. The gown featured two high leg slits and gold adornments, hugging her famous curves. Alex didn’t look too shabby either, wearing a crisp light ensemble, contrasting nicely with his ultra-tan skin. Ahead of her set, Jennifer shared a cute snap of her and Alex contently relaxing in her trailer. She captioned the photo “Ni tu Ni yo #preshowpic” with a heart emoji.